Have you dropped your hard drive and it does not work? We can help. We are hard drive recovery specialists who will be able to end your misery and restore all the data you have lost. It is always a tragedy to find out that you cannot access your precious, hard-gotten data after dropping your external hard drive or your laptop. Big Note! If you have dropped your hard drive, do NOT power it up! You will certainly damage your hard disk more by spinning it. This can potentionally scratch the surface of the media which holds the data. 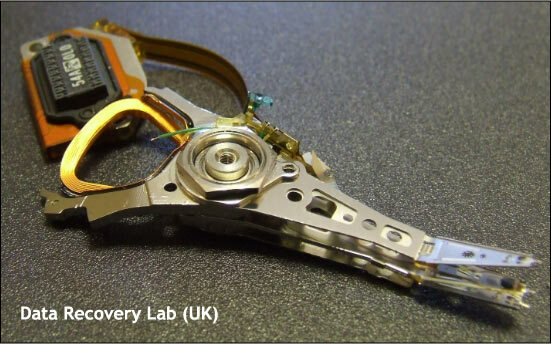 Shock to the read-write heads of a mechanical hard disk will dislocate them and if you power up a dropped hard drive, spinning it at a rate of 7200 RPM (rotations per minute) will certainly damge it more. If you powered it up once or several times, just do not do it again to limit the damage. You must seek professional advice and do NOT be tempted to open the hard drive as there is absolutely nothing that you can to do in order to access your data. This is a situation where you do need a reputable data recovery company to help your retrieve your data. Data Recovery Lab, based in London is one of the top 4 data recovery companies helping companies and private individuals with data recovery since its establishment in 2001. If you are in the unfortunate position of having a broken hard drive, do not panic. Just call 0207 516 1077 for help. You will speak to a data recovery technician who will walk you through the successful process leading to data recovery. We are hard drive recovery specialists and have a very high success rate in hard disk recovery. For more lab notes, visit our external data recovery blog here. Confidentiality of Data & Privacy of Personal Data Guaranteed. © Hard Drive Data Recovery 2001-2013. All rights reserved. Copying content or images strictly prohibited. Any website or individual caught using any copyrighted material will be prosecuted and the violating website will be reported to Google for breach of copyright. Hard Disk Recovery Lab Dephna House 24-26 Arcadia Avenue Finchley Central London N3 2JU OPEN: Mon-Fri 9am-6:30pm, Sat, Sun & Bank Holidays Closed. For Emergency Data Recovery Call 075 380 7 1627. Nearest Tube (Underground): Finchley Central (We are just 4 minutes from Finchley Central Tube Station.) Arcadia Avenue is off Regents Parks Road. When you are in Finchley Central Station, just use the exit to Station Road. When you are in Station Road, walk up to Regents Park Road by turnig right. Take a left turn in Regents Park Road. Go past Lichfield Grove. After a few yards, you should see Arcadia Ave. We are at the end of Arcadia Ave. Go to the reception or ring the Hard Drive Recovery Lab door bell.